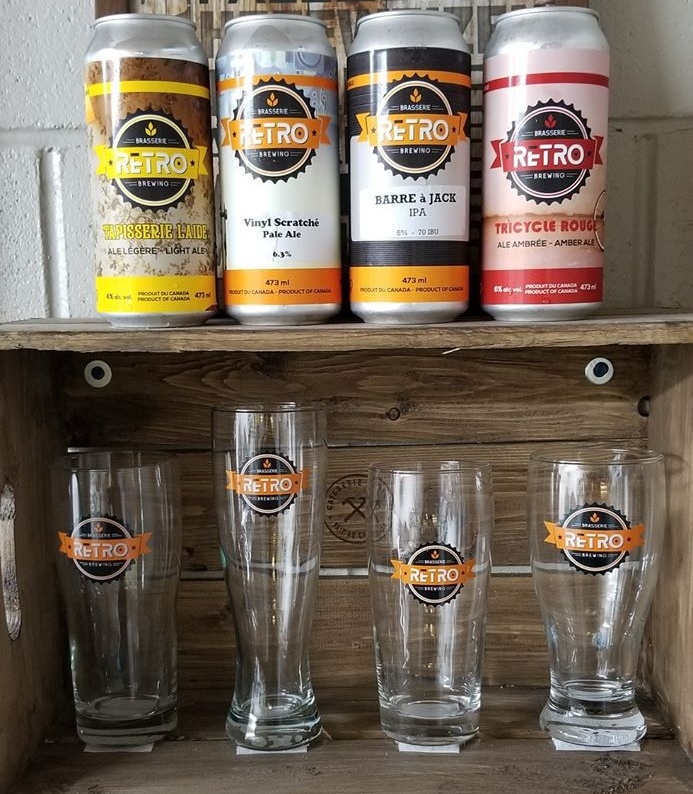 Brasserie Retro Brewing opened in late July in Bertrand, on the Acadian Peninsula of New Brunswick. 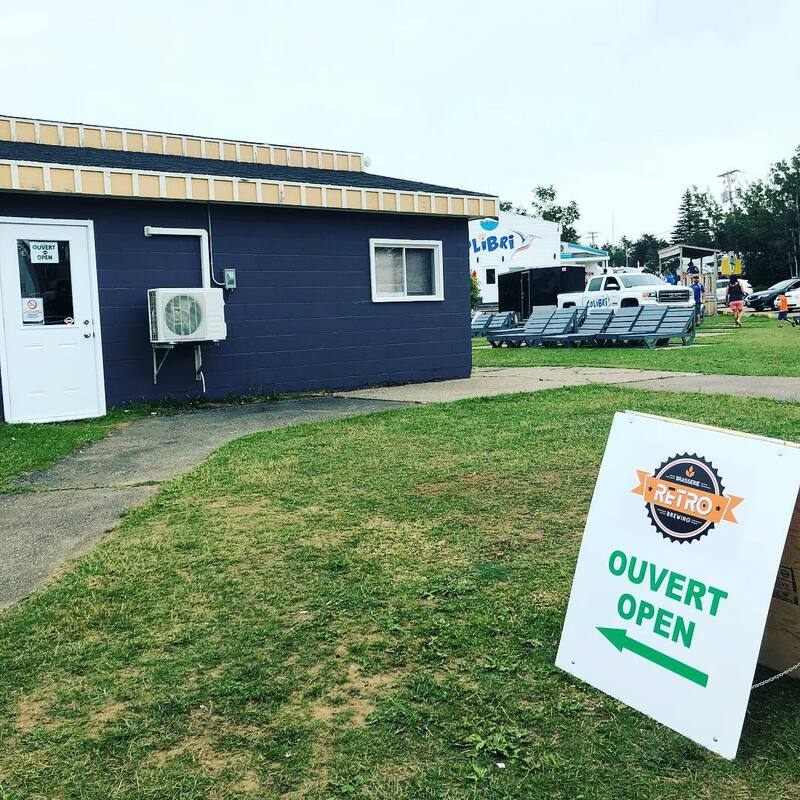 Operating out of the Motel and Campground Colibri on Boulevard des Acadiens, Retro is owned and operated by three friends who met through a mutual love of beer, and have taken their hobby and passion and grown it enough to now share with the public. We spoke with one of the owners, Yves Godin, shortly after they opened. We’re three partners in the company; myself (Yves), Joel Thibodeau and Maxime Hebert. We all work full time jobs and do this (brewing) as an “upgraded” hobby. Joel and I met around 5 years ago at the Oktoberfest des Acadiens, in Bertrand. We both live in Bertrand and started to develop a passion for craft beer because of this Oktoberfest. After talking for a while, Joel asked me if I would be interested to try and brew a batch of beer with an all-grain kit, I jumped on the occasion and five years later we’re opening this micro… no… nanobrewery! After brewing in my basement and in Joel’s garage for 4 years, we decided to take it to another level so we could share our creations with everyone. But the plan was to stay small because we don’t have time to brew full time. That’s when we decided to add another partner to the mix, so we could have a break from time to time. That’s when Max came in to play, early last year. We go with our name on this one. We wanted a short, bilingual name with enough context to play around with. Like the decoration, names of the beers, etc. When Joel proposed Retro, we saw the multiple possibilities that came with the name, it was exactly what we were looking for! So we don’t have any history in our beers, just funny, retro names that we try to match with the style. Can you tell us about the beers you have available currently? Any seasonals or one-offs in the works? – A light pale ale at 4%, easy drinking, fully carbed named “Tapisserie Laide“, which translate to “Ugly Wallpaper”, you know… every had one in the 70’s! – An amber ale at 6%, really smooth caramel taste, named “Tricycle Rouge“, or “Red Tricycle”, again, we all had one as kids. – And the third one is an IPA at 7%, citrusy but not bitter, named “Arcade 2001“. We named this one off of an arcade that we had in Bertrand when I was a kid. We are also brewing one-offs, we need to test the market so we try something different once in a while. If some recipes are more popular than others, we could add more to our regular lineup. – A 6.3% ABV American Pale Ale named “Vinyl Scratché” (“Vinyl Scratch”), with a touch of pronounced alcohol and more hops than usual. – A 5.0% ABV IPA named “Barre à Jack” (“Jack’s Bar”), a blonde-coloured beer with more hop aroma, flavour, and bitterness than our other offerings, perfect for hop-heads. How can folks interested in Retro try your beer? Because of our size (200 litres), we decided to sell 473ml cans and refill growlers (more on that below), only on location at the brewery. We plan to sell kegs to restaurants and other bars starting this fall. We’re located on a camping ground, so all the beer will be sold onsite during camping season. We’re not licensed for consumption at the brewery, that’s in our future plans. We sell our own 1 litre flip-top growler, which is yours to keep. We will refill any clean growler, no matter the brewery marking, style, or size. We plan to have a few kegs available for the camping bar throughout the summer, also to the bar “La Brôkerie“, a popular bar in Caraquet, only open during summer time. The rest of the year we hope to sell to local restaurants. We had lots of help from a few brewers, we couldn’t believe it! 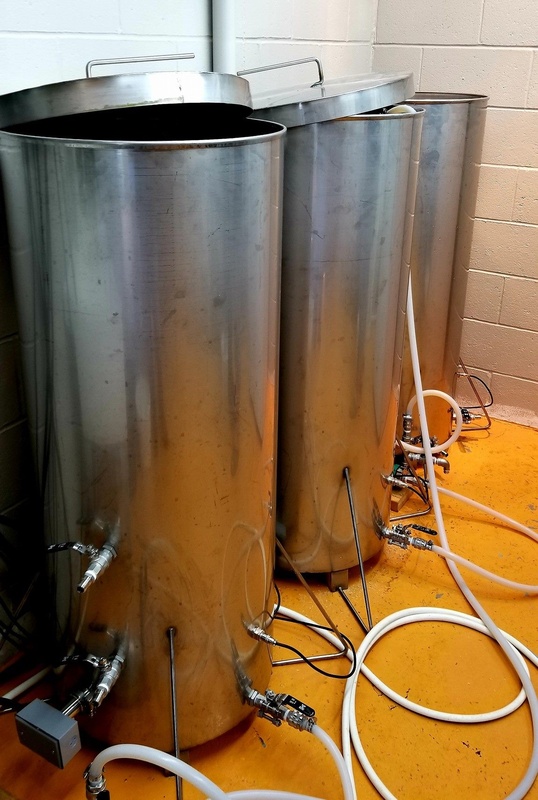 We heard of the “camaraderie” in the brewing world but it’s still a business, so we thought that the brewers we knew would help us a little bit to get started and that’s it, but we were wrong about that! I can say that all the breweries we approached for help to get started were more than happy to help us! I’m talking mainly about those we knew; Fils du Roy, Acadie-Broue, Brasseux d’la Côte, CAVOK, Four Rivers, Savoie’s Brewhouse and Petit-Sault, but also all the breweries that we talked with at all the craft beer festivals we went to! Because of all their help, tips and tricks, we were able to open our own brewery with good beers, all thanks to them! Now it’s our turn, we’ll gladly help anyone who wants to open a microbrewery! Maybe have a brewpub. We’ll have to check with the owners of Motel Camping Colibri if they would be willing to expand. If we always run out of beer, we could maybe hire a brewer to brew all week. But… we just opened so we’ll see where it takes us. Tell us about the brewery itself, what type of system are you be brewing on? We’re small… like 200-liters kit small, and 200 litres would be max, it’s more like 180 litres. And the brewery itself?? It’s 13 by 19 feet! We have our 3 kettles, 3 fermenters, double sink, a (single head) canning machine, label applicator, sales counter, 3 fridges and a hot water tank crammed in there! Our kettles were made by a local shop, we fitted them with hot water elements, so we’re electric. We plan to brew once a week, making between 9 to 10,000 liters yearly. At this point, we appreciate all kinds of beers, really, I think every style has its reason, time, and, place. My favorite style of beer is “a different style than the last one”. Not really, we like to experiment with different ingredients when we have time. Congratulations to Yves, Joel, and Max on their recent launch. To celebrate their official opening, they are holding a contest on their Facebook page, so be sure to check it out! They are open all summer, Monday-Saturday 1-9PM, and Sunday 1-5PM, at the Motel Camping Colibri at 913 Boulevard des Acadiens in Bertrand. Their Instagram page is now live, so be sure to follow and tag them when you enjoy their beer! Felicitations Retro! ← Friday Wrap-Up for August 3, 2018 – News from Port Rexton, Yellowbelly, Split Rock, Bootleg, Lunn’s Mill, 2 Crows, Tatamagouche, Meander River, TrailWay, Niche, Good Robot, Picaroons, Tidehouse, and much more!